JANUARY 11--A web site featuring a phony Rush Limbaugh endorsement of OxyContin is the target of a Drug Enforcement Administration probe into the illegal online sale of prescription medication, records show. After serving Google with a search warrant, federal agents last month received a year's worth of e-mail from a Gmail account used by the proprietor of 1oxycodone.com. According to a U.S. District Court affidavit sworn by DEA Agent Efren Buenrostro Jr., the Gmail account has been used to "facilitate drug trafficking activities." As part of an undercover operation, Buenrostro exchanged e-mails with 1oxycodone.com representative "Alex Kruger," who offered to ship him the powerful painkiller Hydrocodone, a Schedule III narcotic (Buenrostro was directed to pay for the drugs via a Western Union transfer to Malaysia). 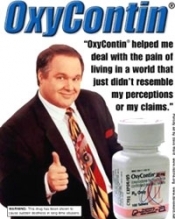 A photo of Limbaugh is at the top of the 1oxycodone.com front page, along with a purported testimonial from the radio host, who is quoted saying that OxyContin "helped me deal with the pain of living in a world that just didn't resemble my perceptions or my claims." Limbaugh, 58, was once addicted to the pain medication and engaged in "doctor shopping" to secure a steady supply of the drug. In a settlement with Florida prosecutors, a felony case against Limbaugh was dropped after he completed addiction counseling and avoided other criminal entanglements. The DEA's search warrant affidavit includes a printout of the site's front page with Limbaugh's photo. The probe of 1oxycodone.com, which is focusing on felony narcotics distribution and conspiracy charges, appears to be part of a larger federal investigation "targeting domestic and international sources of supply" of controlled substances being distributed via the Internet.